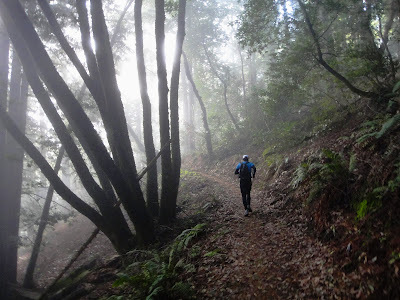 Even though it was only my second official ultramarathon, a mere three weeks after my first, I had ambitious goals for the Crystal Springs 50K. First, after figuring out that I could in fact travel 31 miles without coming down with "hurty foot" (which I will now regard as an official medical term for the condition of a cyclist's feet when they first take up running), I wanted to run a significantly higher percentage of the course than I did in the Rodeo Beach 50K and last half of the Bear 100. 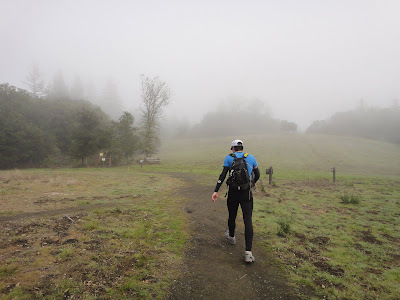 Even if it was a 4.5 mph jogging stride as opposed to a 4 mph speed hike, I wanted to emphasize consistency in running, as a test of my running endurance. Secondly, I wanted to improve my downhill stride, and try to relax so I could run with more fluidity and less pain. Thirdly, I wanted to finish with a time closer to the six-hour range — a big jump from my 6:58 in Rodeo Beach. Fourthly, I wanted some sunshine. No way was I traveling all the way to California and being shut out from badly needed vitamin D yet again. And lastly, I wanted to take pretty photos. That was most important. Even if it meant stopping occasionally so they didn't all come out blurry. The day I care more about a race result than the experience itself is the day that ... well ... let's face it, it's just not that likely. The Crystal Springs 50K was held in the Santa Cruz Mountains south of San Francisco. I travel to California to visit Beat but the Bay area has the added bonus of ultramarathons nearly every weekend, even in the depth of winter. The weekend weather was extra chilly for the region, with overnight temperatures dropping into the mid-30s and frost forming on the higher hillsides. I dressed in what I thought was appropriate for those temps — tights and a long-sleeve thick polyester shirt, wool socks, hat and gloves, then carried a backpack with extra layers, food and water — because even in organized races I prefer to pretend I'm out for a self-supported training run, even if I end up solely eating peanut butter sandwich quarters and drinking Coke in tiny cups while my backpack dangles uselessly off my shoulders. And of course, the Californians all showed up wearing shorts and T-shirts and carrying a single bottle in their hands. It made me ashamed to call myself a hardy Montanan-former-Alaskan, but I figured it didn't matter. I was there to run my own race. Things went great for the first 12 miles. 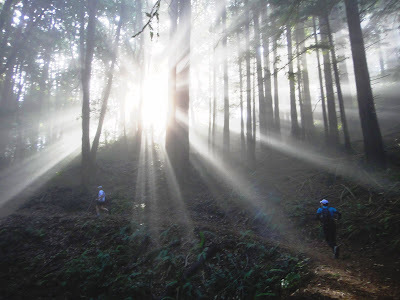 I was running consistently, soaking in beams of sunlight where it broke through the fog, and making good time on my mile splits. I found my place in the pack but reeled in a couple of people, including the "girl in the cute plaid shorts ala Danni." Beat stuck with me and told me my pace was pretty hard, and said I should think about dialing it back. But I knew I felt good and I knew I could hold it. Even though I haven't been a runner for very long, I have enough experience in endurance efforts to sense when the bottom might drop out. However, I have a particular grating problem as a runner in the form of inexplicable midsection cramping on descents. Downhill grades cause a sensation that is best described as someone taking a dull knife and stabbing it deep under my rib cage. It's probably related to breathing and at least partly psychological, but when it flares up on long, steep downhills, I become both extremely slow and extremely irritable. I groaned as I shuffled down the hill. Beat tried to offer suggestions and I got testy with him. He couldn't help but laugh at me. Angry race Jill is not unlike an angry toddler — too irrational and scrunchy-face cute to be taken all that seriously. Meanwhile, toddler gets more and more scrunchy faced and angry until finally she blurts out, "I just want to go into my pain cave. Why can't you leave me in my pain cave?" Beat laughed at loud. "No pain cave for you!" he said in his best "Soup Nazi" accent. I laughed back at the absurdity of the situation and accepted my role in it. I stopped and took four Advil, and over the next seven miles was able to recover my cramp from "searing agony" to "low-level ache" to "not much at all." At mile 19, I finally perked up and started to breeze along the trail again. I reeled back in the women and a couple guys who had passed me during my sophomore slump. My feet felt light and fast against the strange sensation of running on actual dirt. The final 5-mile singletrack descent was truly fun. My cramp had abated and despite tired legs I picked up some speed, flying through the trees with feeling of effortless freedom, almost like being carried by wheels. 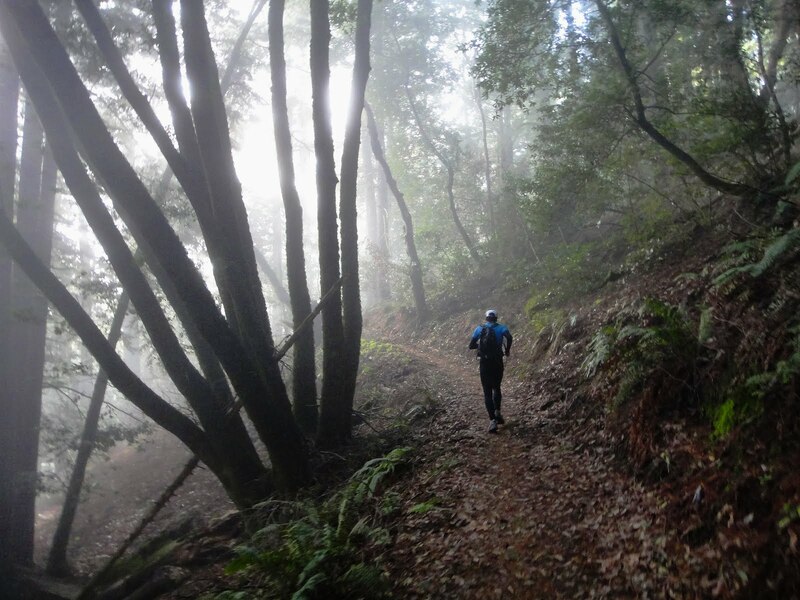 The worst part about running is there's no coasting, and every difficult downhill reminds me of that. But if I can dial in a downhill run enough to move freely without pain or fear, it's one of the best feelings. We strode across the finish line with 6:12 on the clock — not quite as close to six hours as I had hoped, but still a fair improvement on Rodeo Beach. Beat chatted with his friends (he seems to know most everyone in the Greater Bay Area trail running community) and I found my way over to the finisher's food table to make myself a massive turkey sandwich. The sandwich was almost the size of my head and nearly muffled out the race director's announcements from the other side of the pavilion. Then suddenly I heard him say, "Jill ... Horner." That sounded suspiciously like my name. Perhaps I finished third in my age group or something like that. I set down my sandwich and sheepishly walked to the front to see if Jill Horner was in fact me. The director doled out medals to age group finishers, and then handed me a mug. 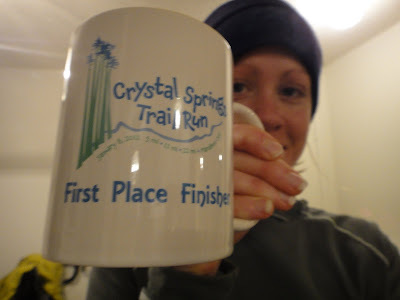 The mug said, "First Place Finisher." I looked back at the race director, confused. First in what? He must have sensed my confusion because he said, "You're the first woman. Congratulations." Beat, who officially finished one second behind me, jokingly pouted. "I never win anything." I held the mug in my hands and reasoned with it. It was a small race ... just a few dozen people ... and it was winter when not many people besides Susitna freaks are training with all that much gusto. But I was a Montanan in California, running dirt when I'm used to running on snow, running when I'm used to hiking and cycling, at a distance most people spend months specifically training for. And I won the race. Maybe I'm not so terrible at running after all. I'll take it. Yay!! What a great story. I have my second 50k this weekend, here in Southern California. My bikes are starting to miss me! Do you have a schedule of the runs you are doing up anywhere? Great job. Hope you got some Peets coffee while there! awesome job!!! 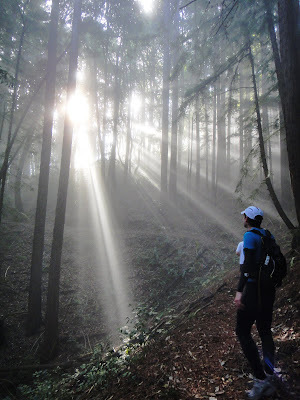 and very cool picture with the sun streaming through the trees. Now that you have taken up running and are a great biker.... does this mean the Iron Man is next? wow Jill you are amazing! I am jealous that you are getting back to Anchorage and Alaska....I will get back someday!! Enjoy! Don't care much about the result-the real win here was the photos. Bravo! I am with meghan. You've arrived:) What you didn't know you liked - Beat had made you find. It is often like that. Congrats to you. And say hi to Beat. Nice! I saw that you had won the race when I was on Realendurance yesterday. Congrats that is awesome. Congrats on your fantastic accomplishment, Jill. Can't wait to follow along on more of your running adventures! Congratulations Jill. Love the photos ... as usual. I have to say the comment about dirt under your soles made me extremely jealous. Sounds dreamy. Never underestimate the possibilities and your abilities! Heck, you may win Susitna! The beautiful part of this is since it's a brand new sport to you, we don't really even know what you're capable of. How fun! Jill, I love your attitude about everything. Also, I admire the fact that you can stop and take beautiful photographs during a race and still manage to finish in first. Amazing!! Now, if I were to do that on one of my rides with my amigos I would fall onto a great deal of scrutiny. It seems the only time I take photos is when I'm alone. I can't even imagine what they would say if I stopped to snap a pic during a race. And first price for making great photos, again!! Way to go Jill, very inspiring. I had same problem with side stiches when I transitioned to running. The problem was operator error--I needed to learn to belly breathe. Perhaps the same might work for you? One of these days, we can say "I knew her when." Congrats Jill! AWESOME! That is so cool. Congratulations! Congratulations! There is no doubt that there are more great blogs to come. I believe the trick with downhill belly is practice. Your tun has had years of being supported by your saddle and your knees and needs to adapt to being upright again. I have the same bother but fell running in the peaks seems to be sorting it out.